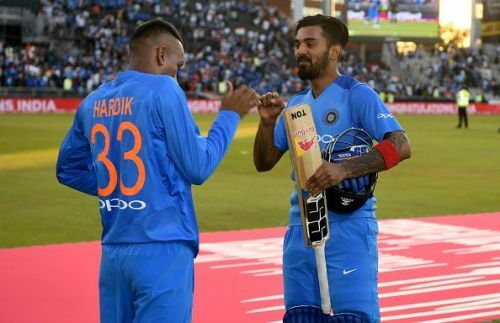 All-rounder Hardik Pandya and opening batsman KL Rahul are in danger of missing India's upcoming ODI series against Australia. The duo, who are under the scanner for their controversial comments in a talk show, could face immediate suspension pending an inquiry. Taking a cue from the sexual harassment case involving BCCI CEO Rahul Johri during last year, Committee of Administrators (CoA) member Diana Edulji has called for both players to be placed under suspension. In a letter which is in PTI's possession, Diana Edulji wrote, "It is imperative that players be put under suspension till further course of action is decided for this misconduct as was done in case of (BCCI) CEO (Rahul Johri) when he was sent on leave on sexual harassment matter." She added, "Based on legal opinion and the final procedure is laid down to address this issue, will recommend that communication is sent to concerned players and team immediately." Appearing as guests in the popular television talk show "Koffee with Karan", Pandya generated a massive controversy with his 'racist', 'sexist' and 'misogynistic' statements. His disgusting portrayal of women triggered a significant backlash from various quarters. On the other hand, Rahul was also panned for his careless comments regarding his activities off the field. Demanding explanations for their controversial comments, the BCCI had issued a show-cause notice to both Pandya and Rahul. Although both players apologised for their statements, the fallout from the episode meant that they were always going to be under the scanner. CoA chief Vinod Rai recommended a two-match ban for Pandya and Rahul. However, committee member and former Indian women's team captain Diana Edulji decided to seek legal opinion before weighing in on the issue. BCCI treasurer Anirudh Chaudhry called for a stronger punishment than the two-match ban proposed by Rai. There has been some confusion regarding whether BCCI can suspend the two players by invoking their Code of Conduct. The board's legal firm Cyril Amarchand Mangaldas has insisted that their controversial comments on the talk show do not come under the ambit of Code of Conduct. Edulji's letter was in response to the legal firm's recommendations. Meanwhile, the BCCI are looking to set up a six-member panel to probe the controversy. The first ODI between Australia and India is set to take place at the Sydney Cricket Ground on Saturday. With less than 24 hours to go before the match gets underway, the uncertainty regarding the availability of Pandya and Rahul has hit the team management.